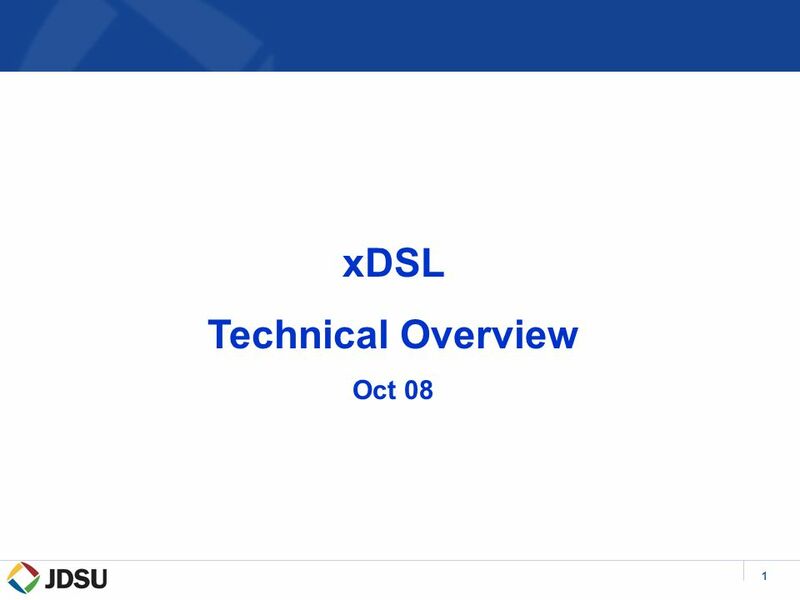 1 xDSL Technical Overview Oct 08. 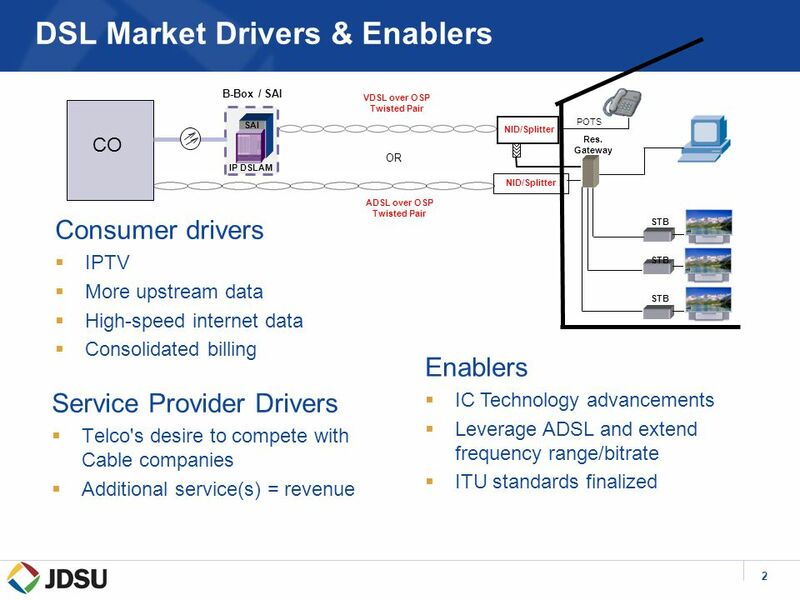 2 DSL Market Drivers & Enablers Service Provider Drivers  Telco's desire to compete with Cable companies  Additional. 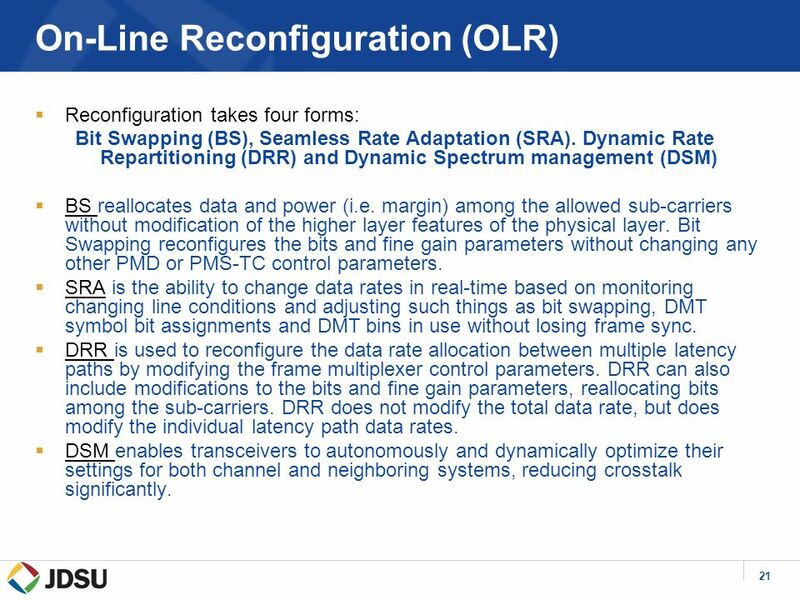 21 21 On-Line Reconfiguration (OLR)  Reconfiguration takes four forms: Bit Swapping (BS), Seamless Rate Adaptation (SRA). Dynamic Rate Repartitioning (DRR) and Dynamic Spectrum management (DSM)  BS reallocates data and power (i.e. 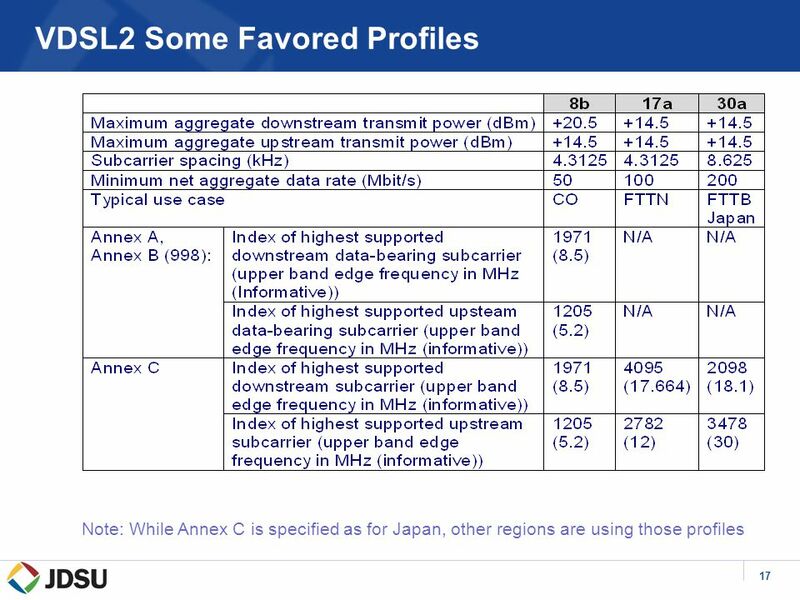 margin) among the allowed sub ‑ carriers without modification of the higher layer features of the physical layer. Bit Swapping reconfigures the bits and fine gain parameters without changing any other PMD or PMS ‑ TC control parameters. 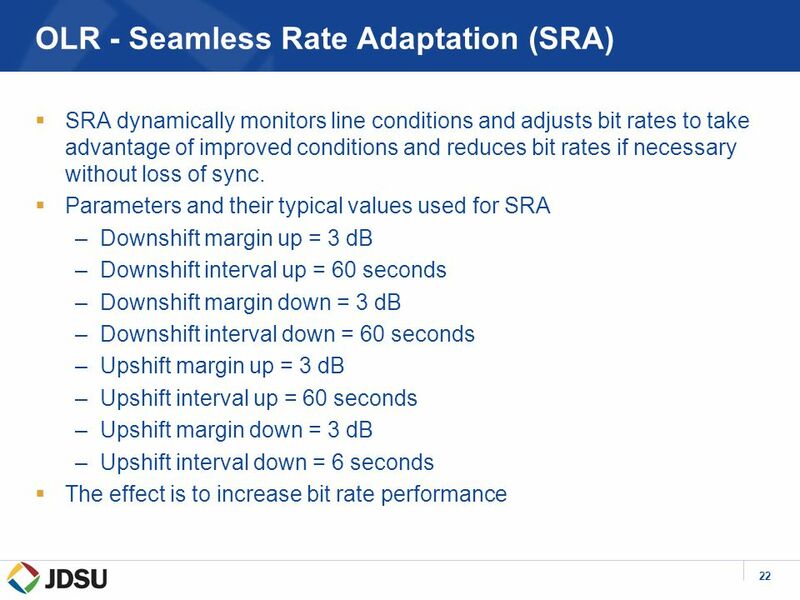  SRA is the ability to change data rates in real-time based on monitoring changing line conditions and adjusting such things as bit swapping, DMT symbol bit assignments and DMT bins in use without losing frame sync. 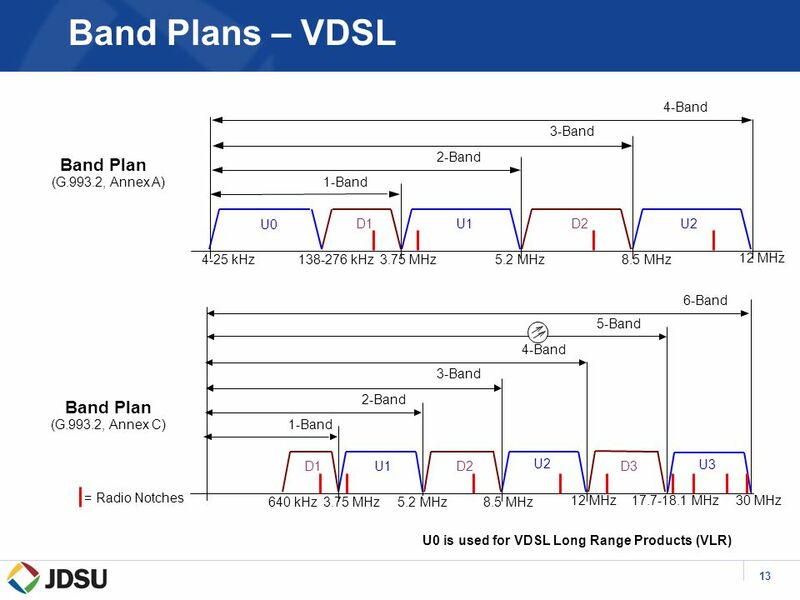  DRR is used to reconfigure the data rate allocation between multiple latency paths by modifying the frame multiplexer control parameters. 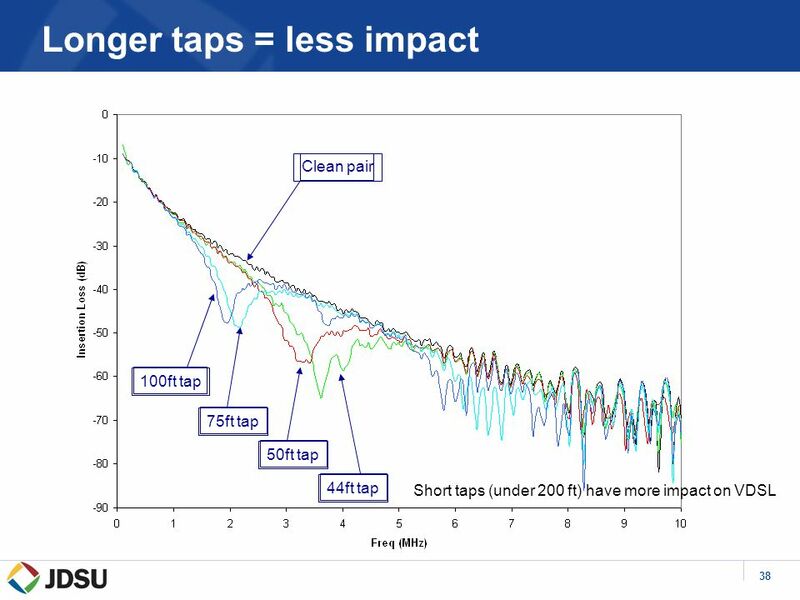 DRR can also include modifications to the bits and fine gain parameters, reallocating bits among the sub-carriers. 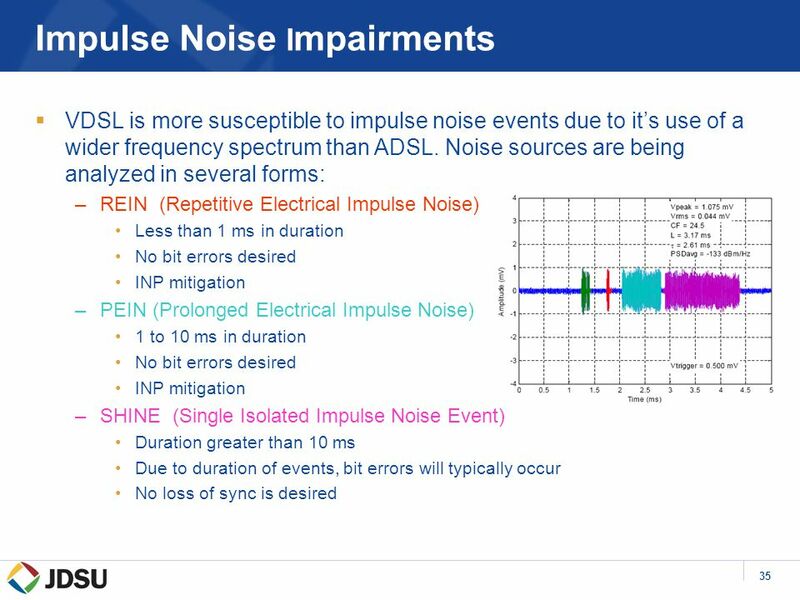 DRR does not modify the total data rate, but does modify the individual latency path data rates. 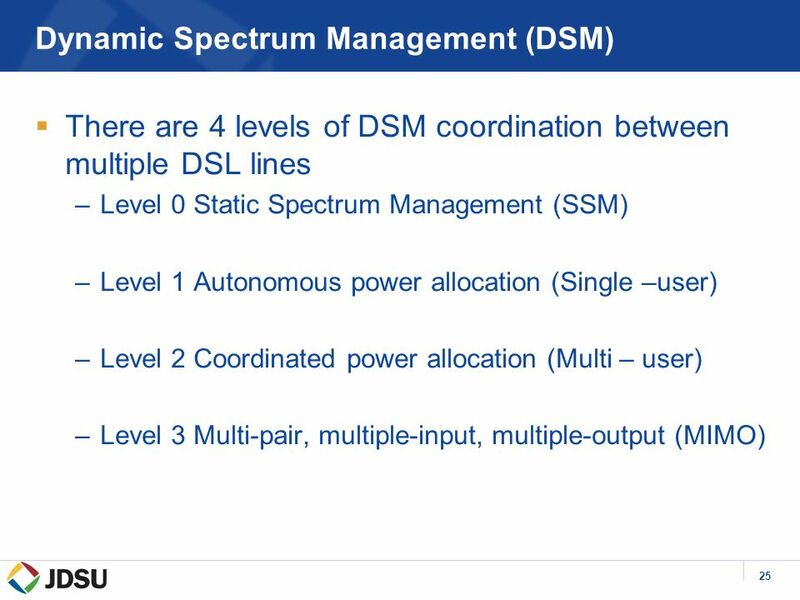  DSM enables transceivers to autonomously and dynamically optimize their settings for both channel and neighboring systems, reducing crosstalk significantly. 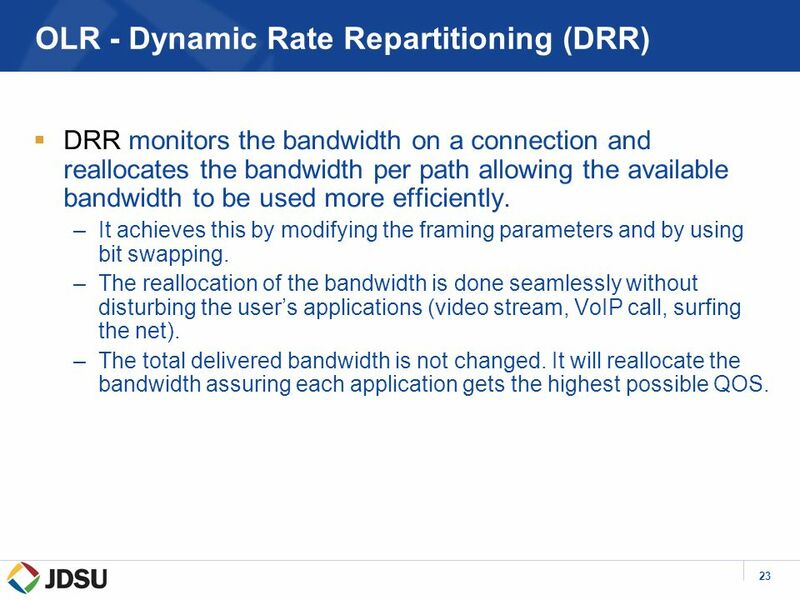 23 23 OLR - Dynamic Rate Repartitioning (DRR)  DRR monitors the bandwidth on a connection and reallocates the bandwidth per path allowing the available bandwidth to be used more efficiently. –It achieves this by modifying the framing parameters and by using bit swapping. –The reallocation of the bandwidth is done seamlessly without disturbing the user’s applications (video stream, VoIP call, surfing the net). 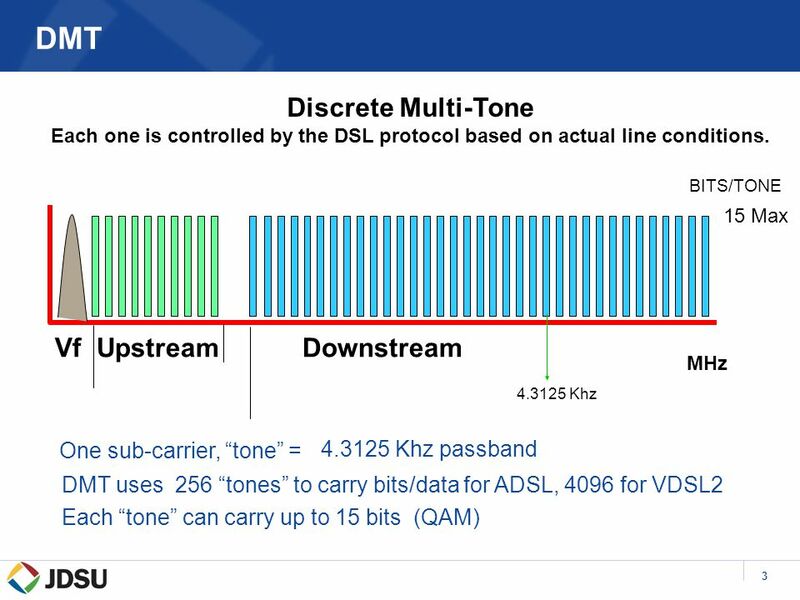 –The total delivered bandwidth is not changed. 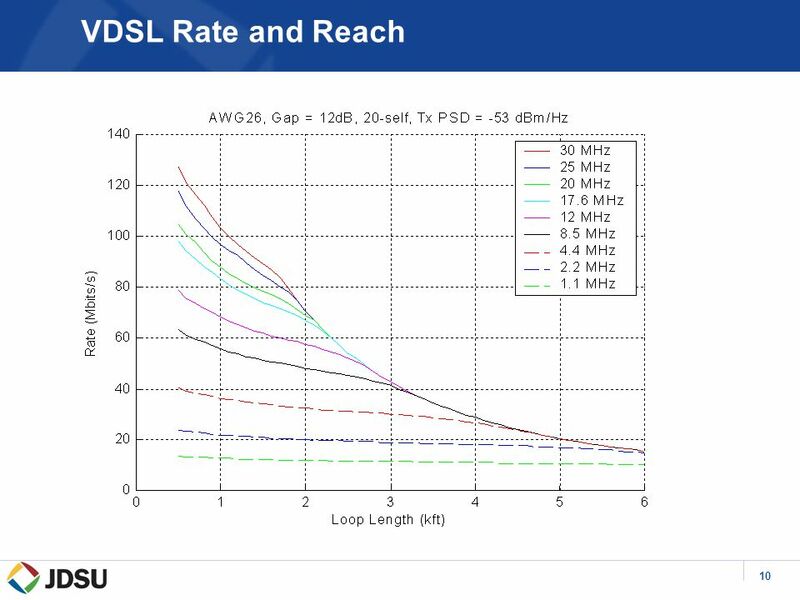 It will reallocate the bandwidth assuring each application gets the highest possible QOS. 26 26 DSM (The Four Levels) Level 0  Level 0: The performance of one individual pair is optimized without considering the other pairs in the binder –Rate Adaptive (RA) and Margin Adaptive (MA) modes of operation. 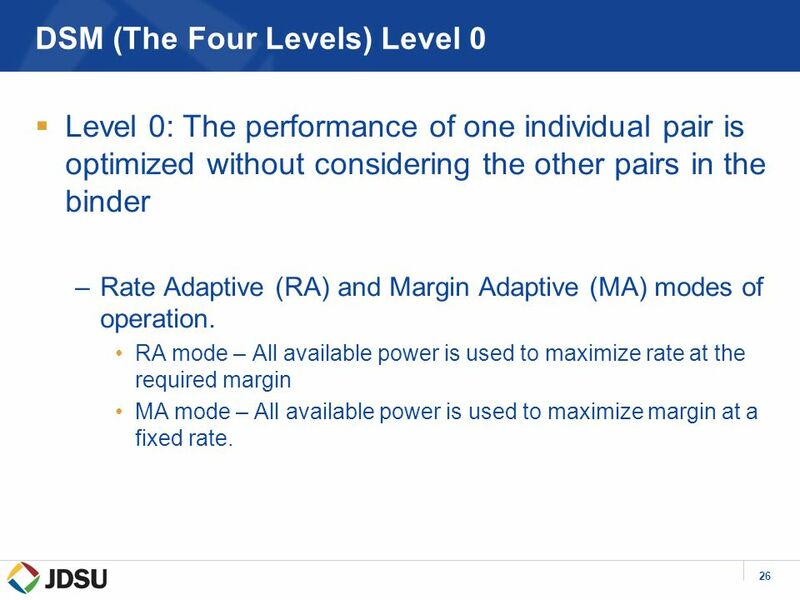 RA mode – All available power is used to maximize rate at the required margin MA mode – All available power is used to maximize margin at a fixed rate. 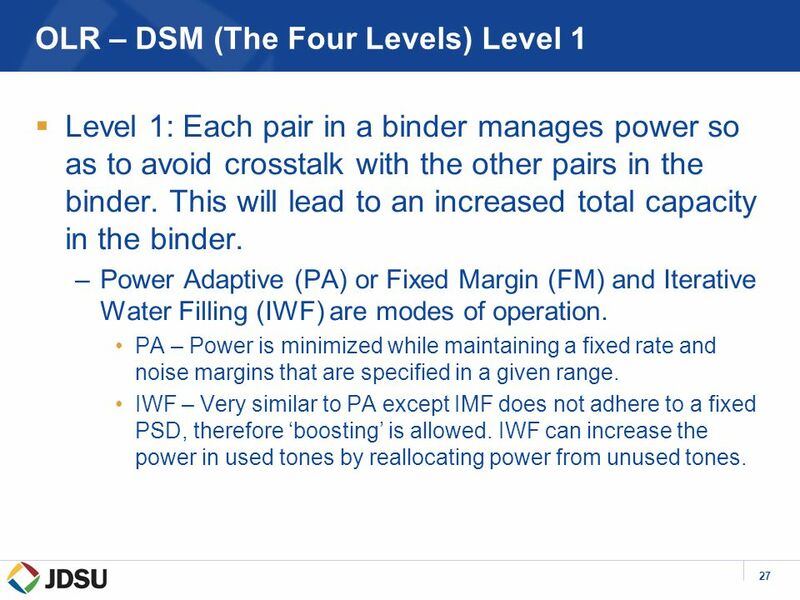 27 27 OLR – DSM (The Four Levels) Level 1  Level 1: Each pair in a binder manages power so as to avoid crosstalk with the other pairs in the binder. This will lead to an increased total capacity in the binder. 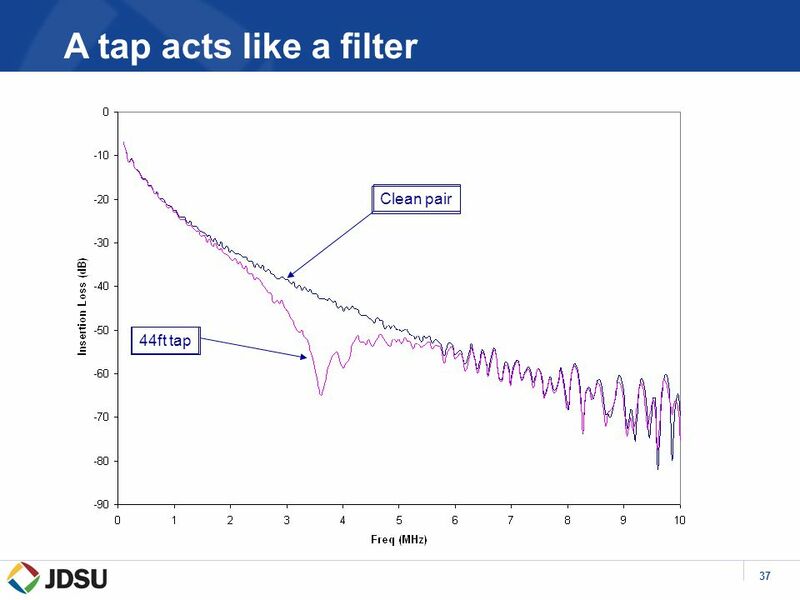 –Power Adaptive (PA) or Fixed Margin (FM) and Iterative Water Filling (IWF) are modes of operation. 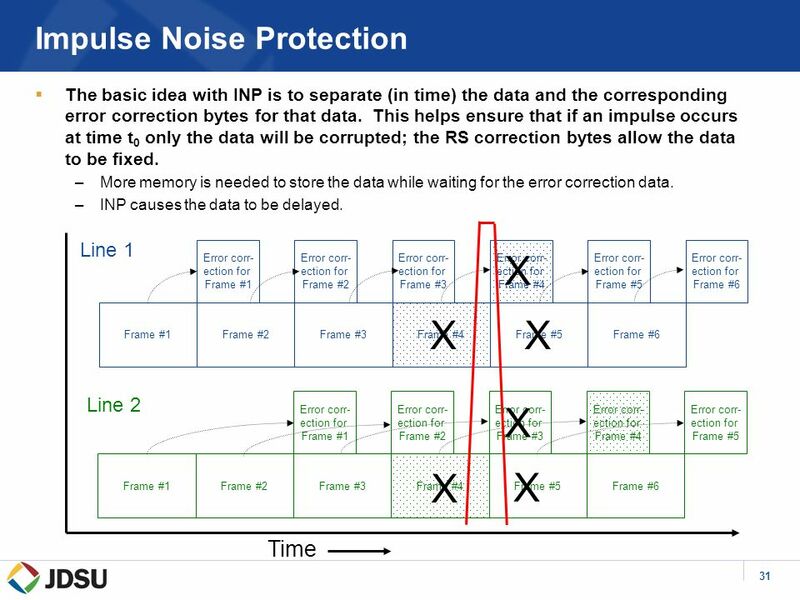 PA – Power is minimized while maintaining a fixed rate and noise margins that are specified in a given range. IWF – Very similar to PA except IMF does not adhere to a fixed PSD, therefore ‘boosting’ is allowed. 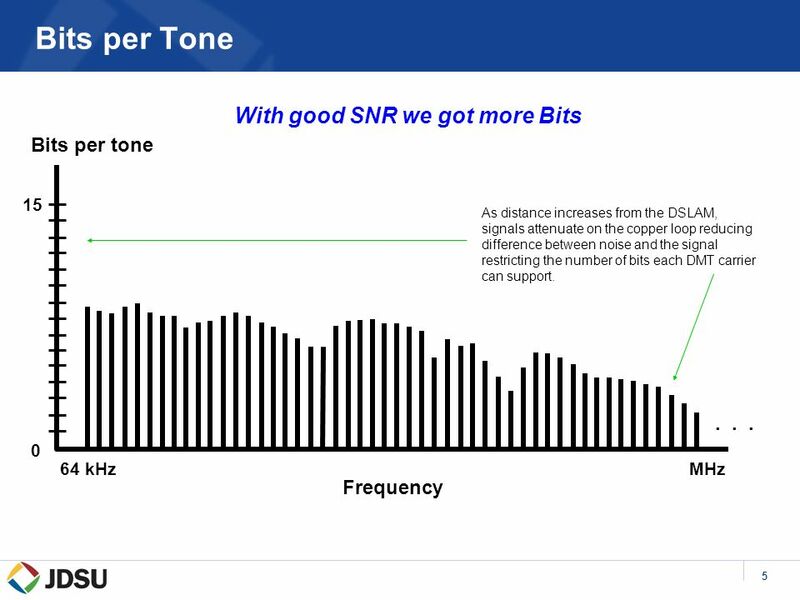 IWF can increase the power in used tones by reallocating power from unused tones. 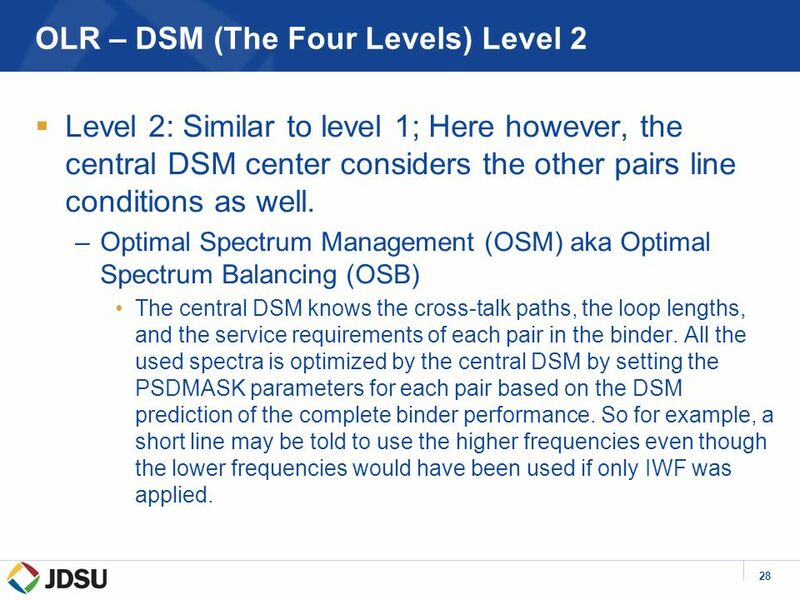 28 28 OLR – DSM (The Four Levels) Level 2  Level 2: Similar to level 1; Here however, the central DSM center considers the other pairs line conditions as well. 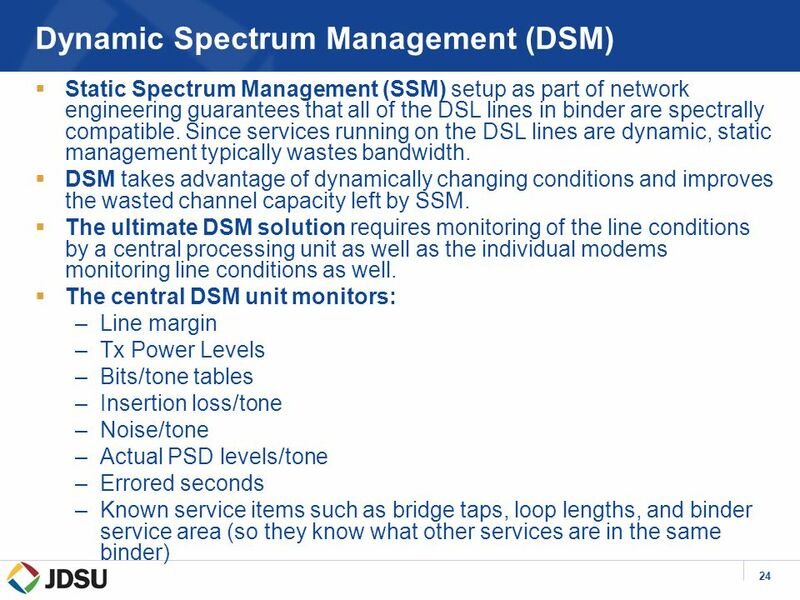 –Optimal Spectrum Management (OSM) aka Optimal Spectrum Balancing (OSB) The central DSM knows the cross-talk paths, the loop lengths, and the service requirements of each pair in the binder. All the used spectra is optimized by the central DSM by setting the PSDMASK parameters for each pair based on the DSM prediction of the complete binder performance. 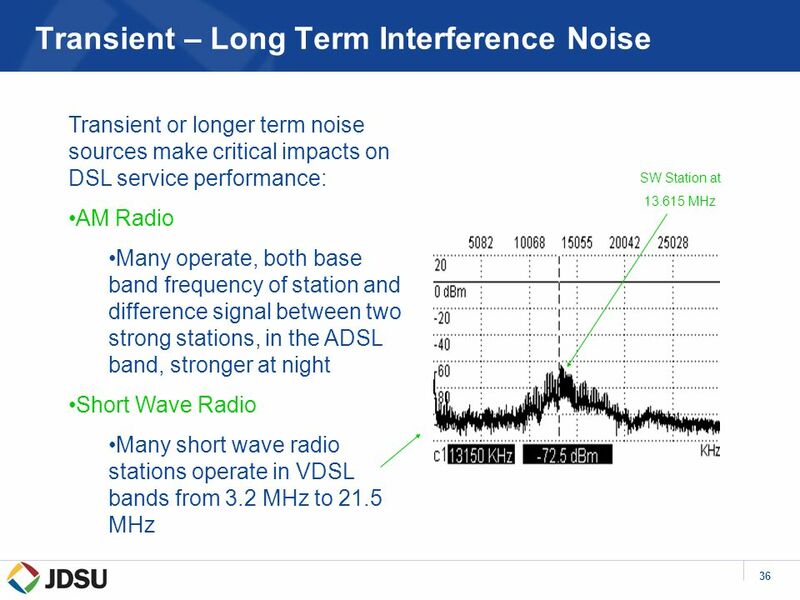 So for example, a short line may be told to use the higher frequencies even though the lower frequencies would have been used if only IWF was applied. 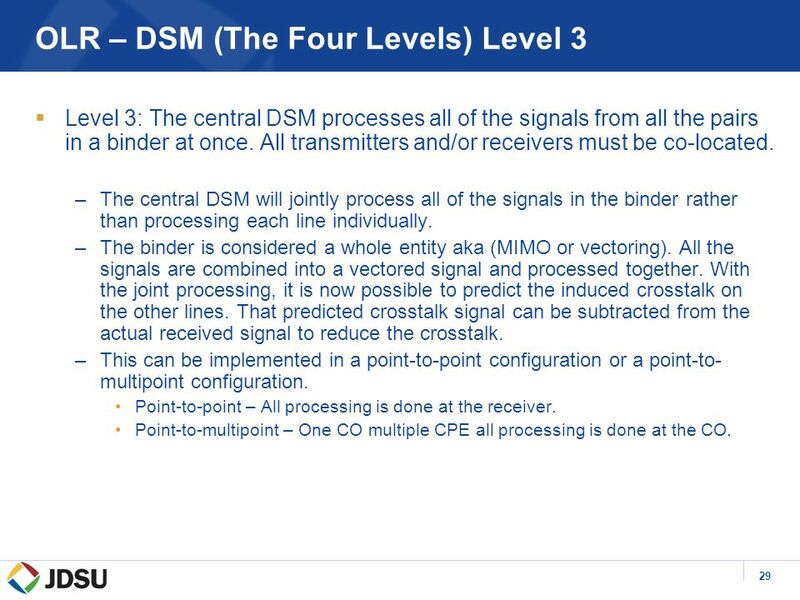 29 29 OLR – DSM (The Four Levels) Level 3  Level 3: The central DSM processes all of the signals from all the pairs in a binder at once. 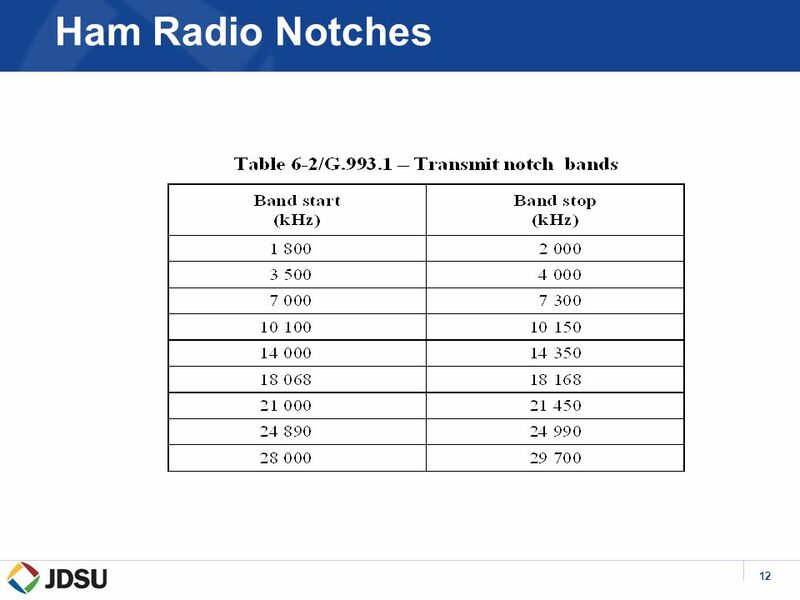 All transmitters and/or receivers must be co-located. 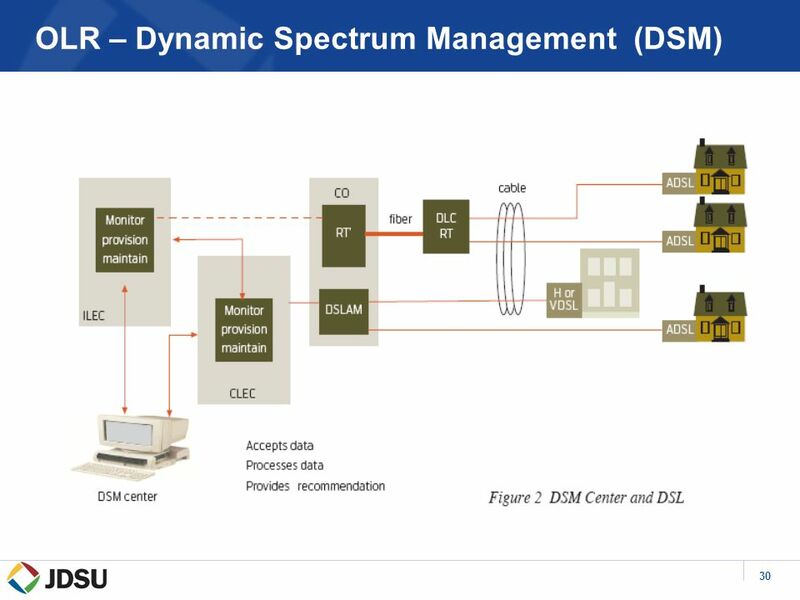 –The central DSM will jointly process all of the signals in the binder rather than processing each line individually. –The binder is considered a whole entity aka (MIMO or vectoring). All the signals are combined into a vectored signal and processed together. 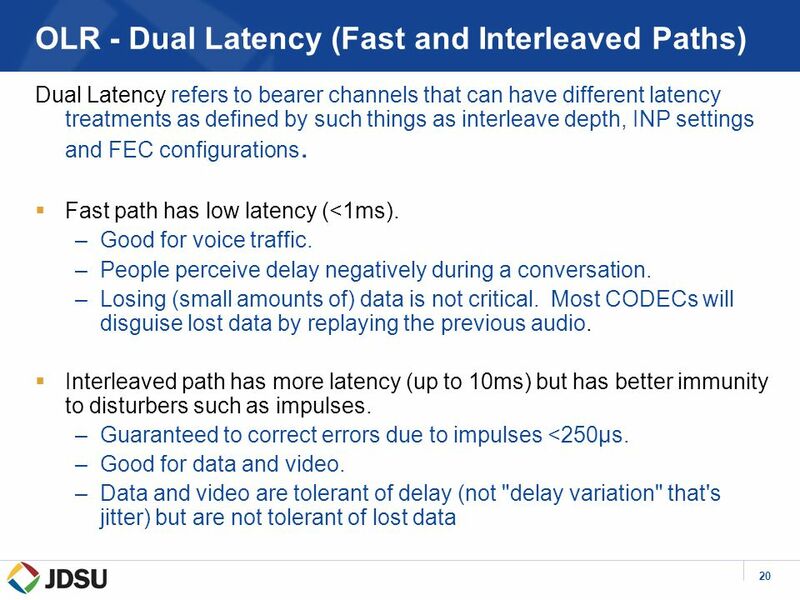 With the joint processing, it is now possible to predict the induced crosstalk on the other lines. 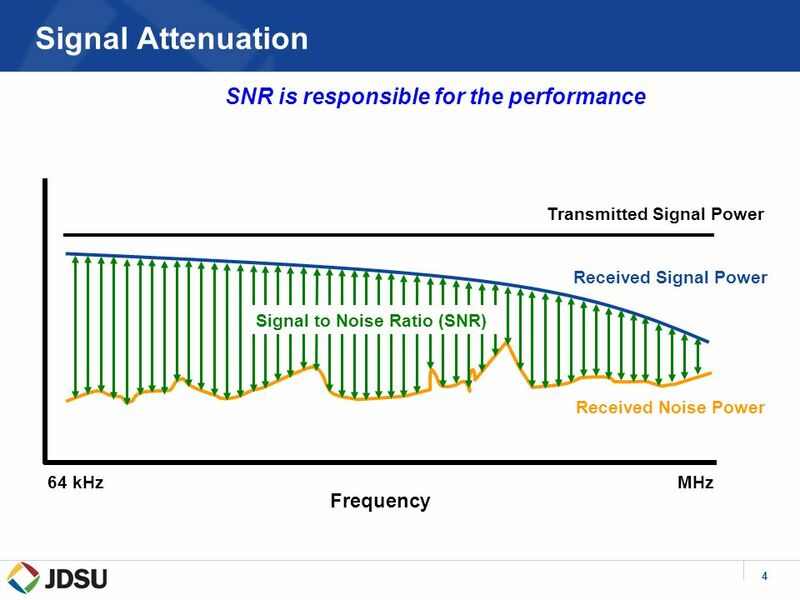 That predicted crosstalk signal can be subtracted from the actual received signal to reduce the crosstalk. –This can be implemented in a point-to-point configuration or a point-to- multipoint configuration. Point-to-point – All processing is done at the receiver. 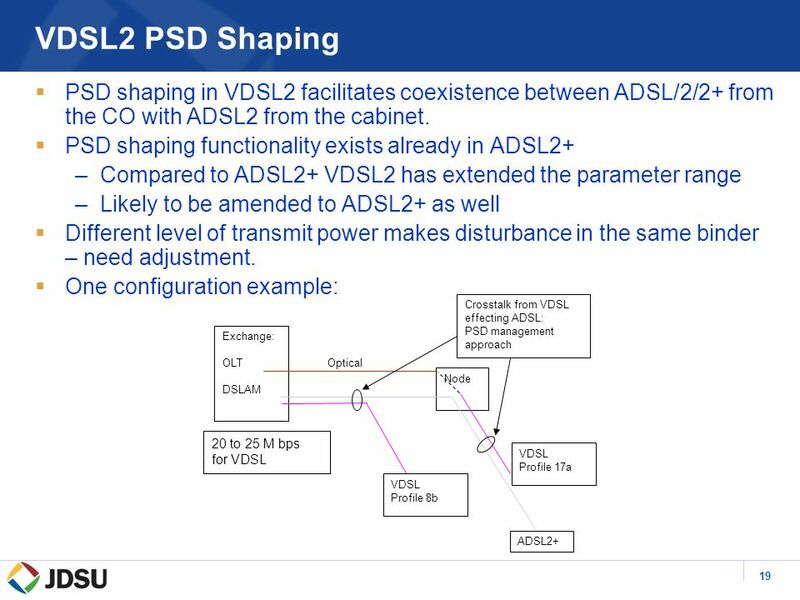 Point-to-multipoint – One CO multiple CPE all processing is done at the CO.
Download ppt "1 xDSL Technical Overview Oct 08. 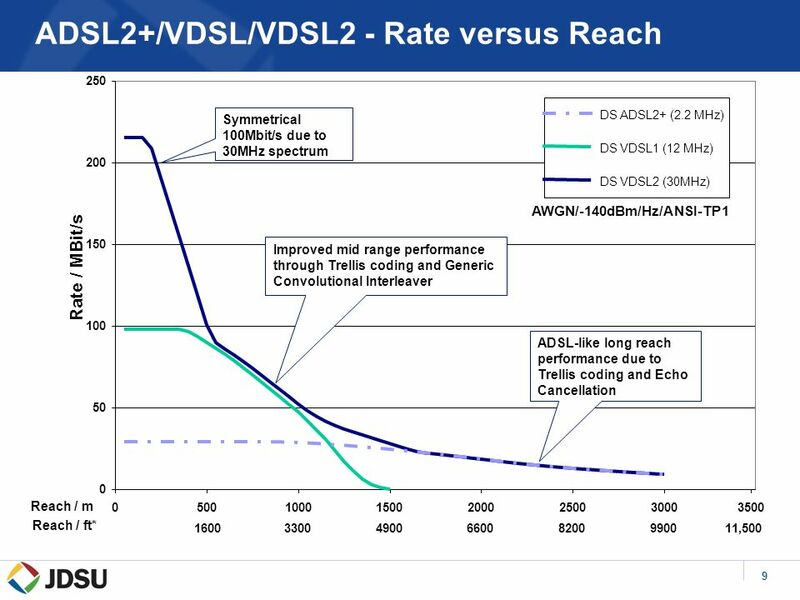 2 DSL Market Drivers & Enablers Service Provider Drivers  Telco's desire to compete with Cable companies  Additional." Introduction to ADSL Technology by: Wenmei Zhao May 3, 1999. 12-Access and Interconnection Technologies Dr. John P. Abraham Professor UTPA. 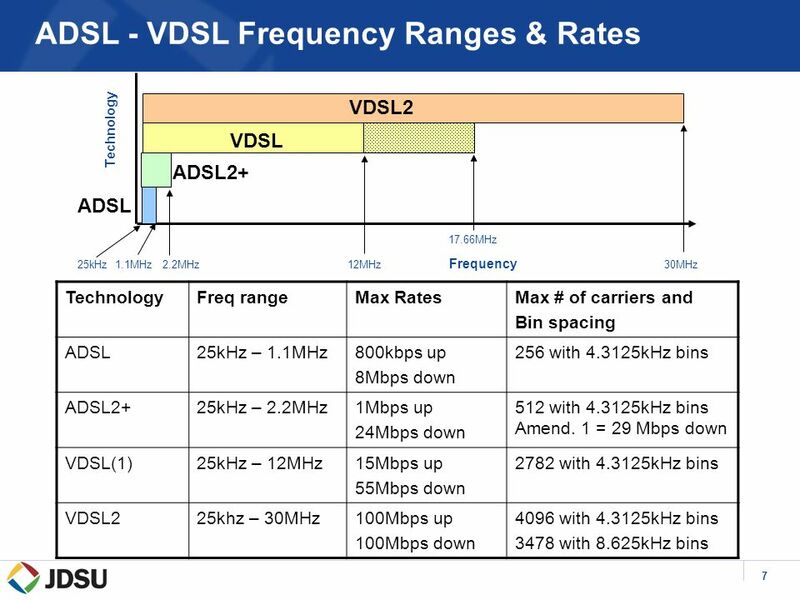 ADSL Technology Evolution ADSL2/ADSL2plus/ADSL-RE Peter LeBlanc 2005. 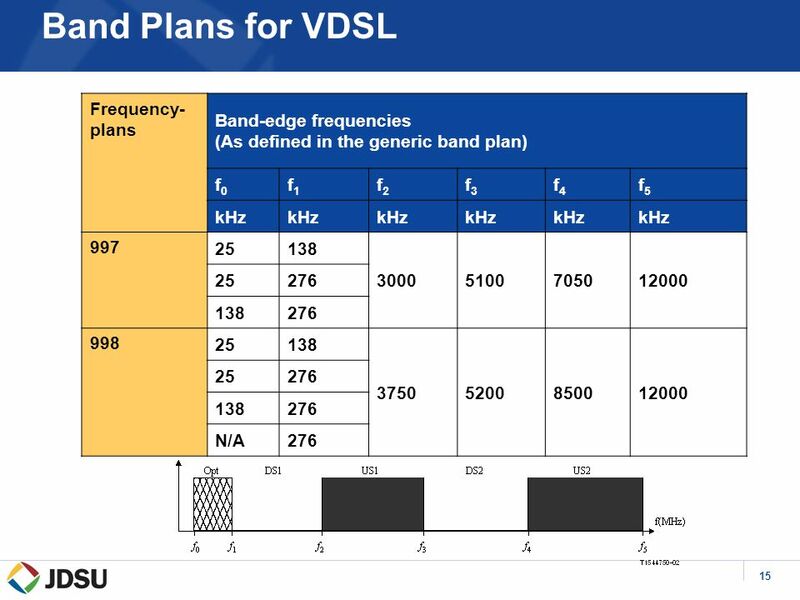 © UNIVERSITY of NEW HAMPSHIRE INTEROPERABILITY LABORATORY VDSL MCM Simulation Tim Clark VDSL Consortium Tim Clark VDSL Consortium. ® Adtran, Inc All rights reserved. 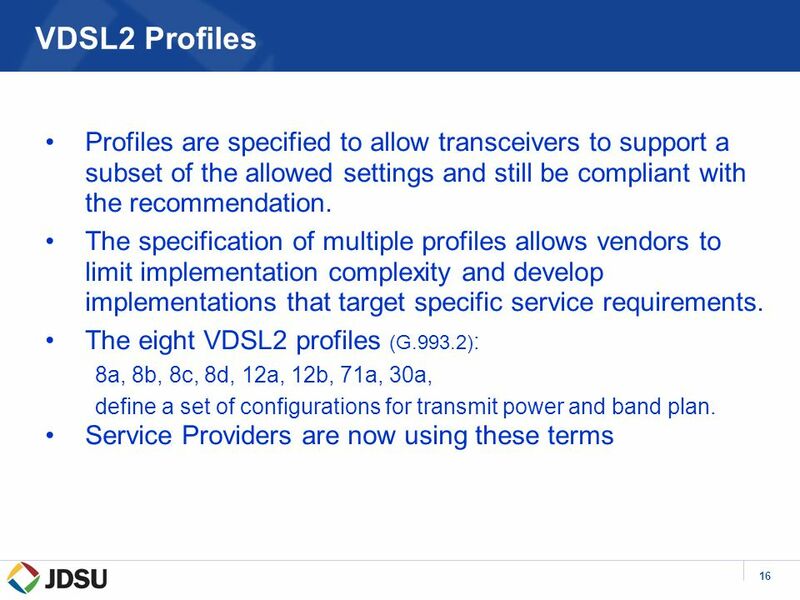 2 ® Adtran, Inc A rights reserved Proprietary and Confidential Vectoring De-mystified Market Drivers Understanding. 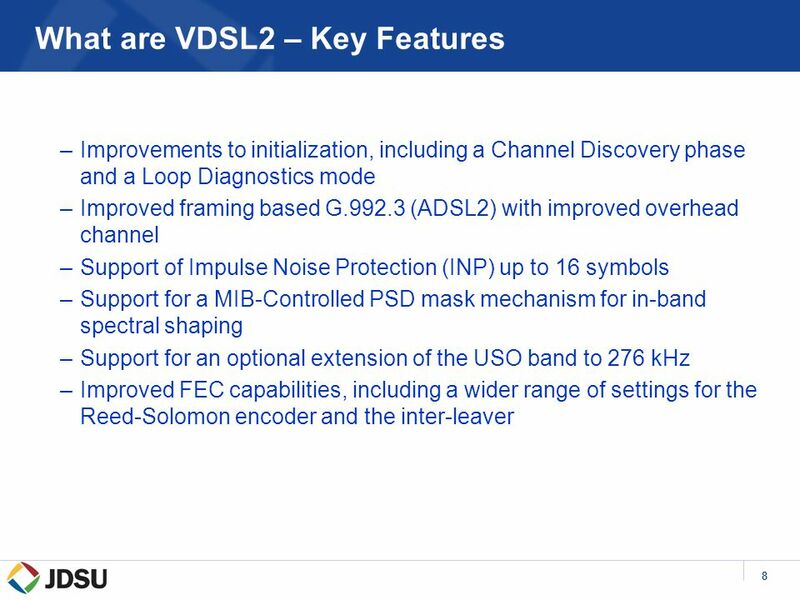 New ADSL2 Standards Which delivers improved rate and reach performance, advanced diagnostics capabilities, standby modes, and more to broadband designers. 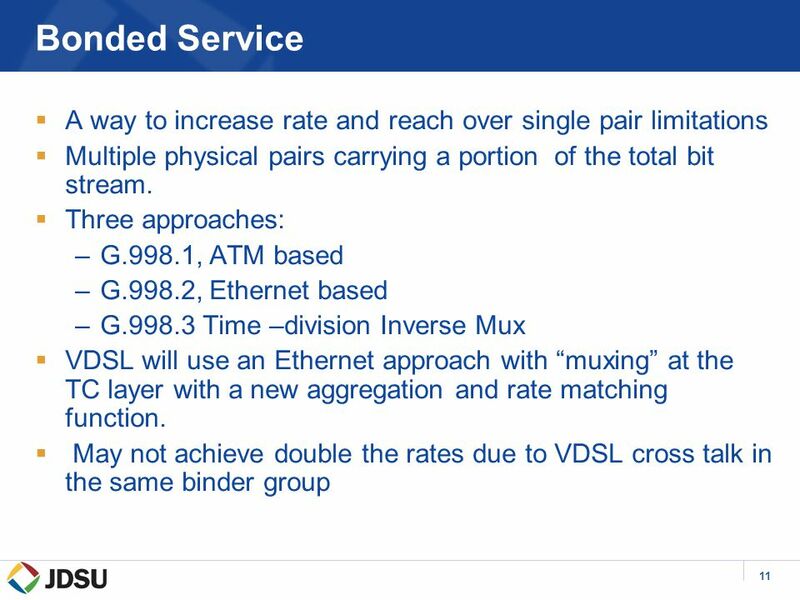 1/28 Chapter 8 Multiplexing. 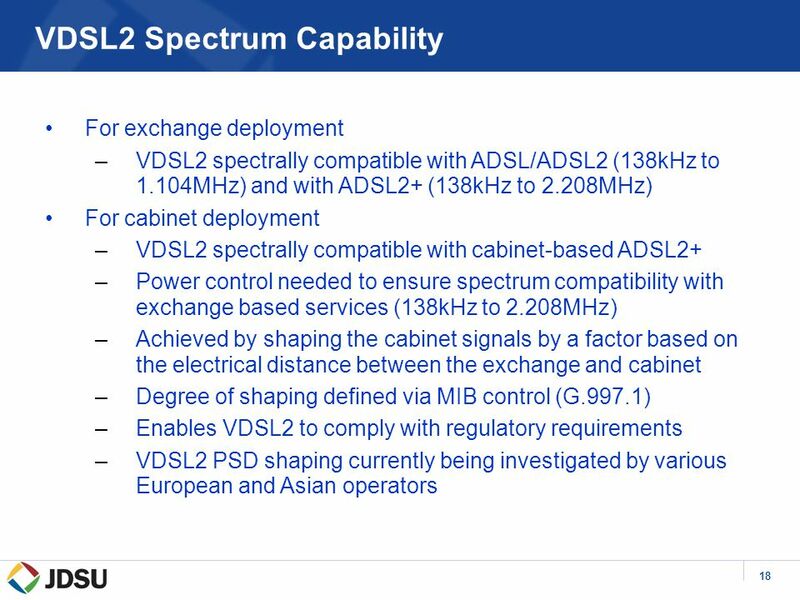 2/28 Multiplexing  To make efficient use of high-speed telecommunications lines, some form of multiplexing is used  Multiplexing. 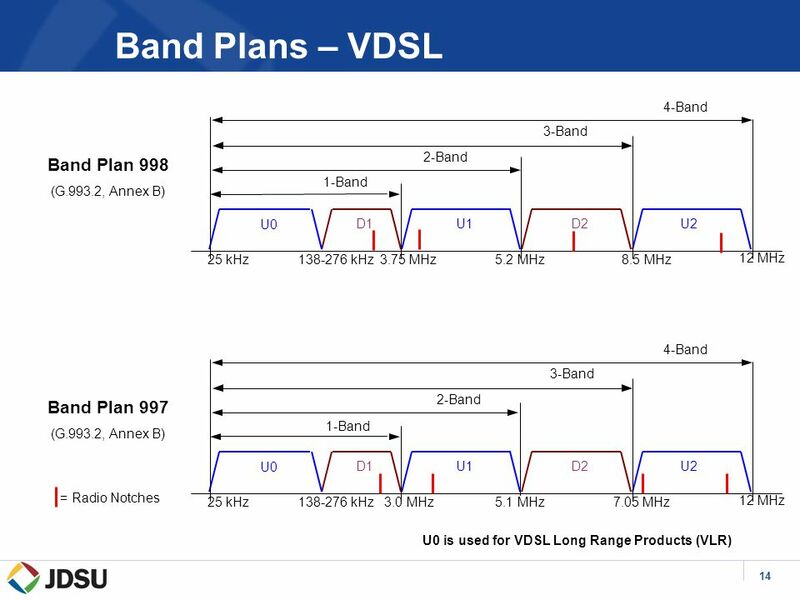 Sistem Broadband Pertemuan 13 Matakuliah: H0122 / Dasar Telekomunikasi Tahun: 2008. 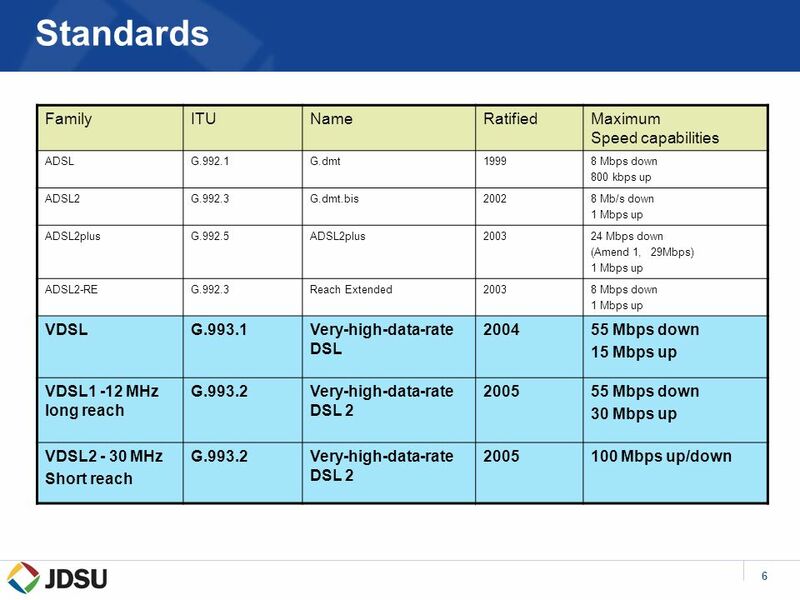 © Copyright 2001 DSLForum, unauthorized use prohibited Introducing the Next Generation ADSL Standard ITU-T Rec. G.992.3/4. William Stallings Data and Computer Communications 7 th Edition Chapter 8 Multiplexing. 1 Chapter 9 Using Telephone and Cable Networks for Data Transmission Copyright © The McGraw-Hill Companies, Inc. Permission required for reproduction or.